Does The Banjo Get A “Bad Rap” At Times? Is the banjo and instrument that sometimes receives undeserved or critical judgment from non-musical observers? At times, I notice references made on television or in public, to the banjo or banjo playing. These comments may include references to Dueling Banjos and mountain men. Once I heard a late night show address the banjo in a comical manner, as though it is as they called it; a “hillbilly instrument”. Some, for effect, like to hum or whistle the first couple of notes of Dueling Banjos as though the banjo is not sophisticated. 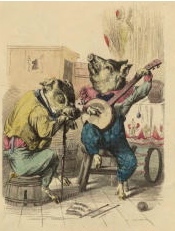 Maybe some well recognized Scruggs tunes, such as the Beverly Hillbillies theme song or Foggy Mountain Breakdown (the theme song from Bonnie & Clyde), may have inadvertently stereo-typed the banjo with a biased or opinionated image of the rural countryside. What the public doesn’t often hear are jazz and orchestral arrangements that are performed by some of today’s best banjo players. Have you heard of Alison Brown or Jens Kruger? If you haven’t, you are missing two of today’s most diversified banjo players, who aren’t afraid to extend the instrument’s reach to jazz, classical or chamber music. Listen to Bela Fleck play his electric banjo with his band the Flecktones, or how his five sting banjo sounds in an album called “Perpetual Motion”, and you will be amazed at the unlimited possibilities this instrument has to offer. As a performer of the guitar, mandolin and the banjo, I find it interesting that when you go to a local music store in many metropolitan areas, a customer is lucky to find one or two cheap and overpriced banjos, at the end of a long row of guitars. The music store owner fails to recognize the instrument’s potential or promote the instrument to the public. Sure, the guitar is one of the most popular instruments to play but even my first banjo class had fifteen registered participants with a wait list of ten. Yet, there were hardly any banjos to be found for sale at local music stores. Ironically, when playing music in public, the banjo has a presence that is captivating. I have played guitar for almost as many years as the banjo. I could sit with another guitar player and strum some of our best tunes without much recognition beyond a polite applause. However, when I put the guitar down and start playing the banjo, the audience comes alive and they are mesmerized. Children, as well as adults, are fascinated with the sound the instrument makes. So what do you think? Does the banjo get an unfair rap? This entry was posted in Banjo, History and tagged ballad of jed clampet, banjo history, banjo music, banjo players, dueling banjos, earl scruggs, foggy mountain breakdown. Bookmark the permalink. I think banjo players ultimately make good guitar players, especially in the finger style discipline. Country artist Keith Urban is a good example of this, being well versed on both instruments. I used to think playing banjo would be easier, with less strings, but after taking Fretmentor’s bluegrass class and seeing these instruments played up close by some skilled players, i think totally different about this instrument. I know i’m captivated by it, especially when Fretmentor works that fretboard! they condemn while offering nothing positive in return. to capture ones commitment to an instrument. I to think the Banjo is getting a bad rap. I just came back from a trip to Galinburg, tenn. you can see that people are making money poking fun at the banjo with T-shirts and bumper sticker. I also play the banjo, and like the author said , when you play out at different places folks eyes light up and comments that they want to hear the banjo. I think it,s a happy sounding instrument and it just makes you SMILE. I heard a DJ on the radio the other day make a negative reference of the banjo and its place in music. I changed the station. I have little tolerance for an ignorant braggard. All musical instruments are artful and the beauty of its sound are found in the heart of the beholder. I’m not a fan of the tuba but, I have nothing but respect for its’ place in the band. The truth is, that person is above himself and just made himself look stupid. Clearly the ribbing that banjos and banjo players get is unfair. Banjos can be strident and obnoxious or as beutiful and expressive as any instrument. Just listen to Jens or Alison, Bela, Tony and all the rest. I think some uniformed people just can’t get past the Hillbilly stereotype. Boy are they ignorant. I have always enjoyed banjo music and I have never really thought of it as an “unsophisticated instrument.” It isn’t like it’s easy to master any musical instrument. I would say that folks who believe it’s a hillbilly instrument are a little unsophisticated themselves. I started listening to banjo as a solo instrument to accompany a solo voice in the Clawhammer style. I was fascinated by the “old timey” sound. One “old timey” player said with distain that when the three finger pickers started playing the banjo they turned a folk instrument into a “machine gun”. I guess by now I’ve learned that music is music and I don’t have to pigeon hole it to like it. I can switch from Roscoe Holcomb and Wade Ward to Bela Fleck and Jens Kruger and not bat an eye. The more the better and a genius is a genius even if its on a kazoo. I used to listen to a college station that switched back and forth through musical time and space but XM stations try to keep everything in neat packages. I’m crusing internet radio searching to the right mix. Maybe someday I’ll find one. The banjo does get a bad rap because some of us don’t recognize how loud we’re actually playing and we are very apt to drown out other instruments. The real truth of the banjo’s worth and contribution to bluegrass is clearly revealed in the history of bluegrass…….in my humble opinion, had it not been for Earl Scruggs when he showcased the banjo and his syncopated three-finger picking style when he joined Bill Monroe and The Bluegrass Boys in late 1945, the real excitement of a banjo might never have been realized and bluegrass would simply be a type of grass growing substantially in Kentucky. 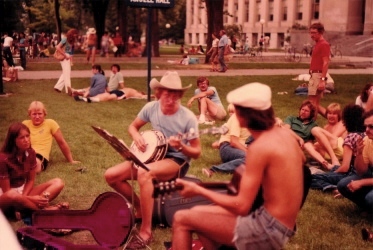 Yes, there were other good three-finger pickers coming along in Earl’s time, but none made the banjo an exciting lead instrument until Earl showed them. God bless you Earl Scruggs!